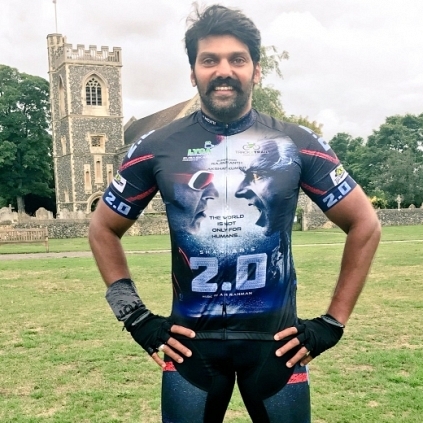 ARYA'S CYCLING CHALLENGE IS THE NEXT BIG THING! Arya is known for his active involvement in the field of sports, which has indeed helped him to be fit with his physique. He will now be participating in the LEL 2017 (London Edinburgh London 2017) cycling challenge race, where the racers would start from London to Edinburg and back to London in five days. This race would cover a distance of 1450 kms, and the most interesting and happiest aspect is that Arya would be contesting in this challenge. Arya took to Twitter today to announce this, "With the blessings of our Thalaivar @superstarrajini & @akshaykumar set fr #LEL 1450kms Startn #july30 Thx @rajumahalingam fr all de support"
At this moment, we send our best wishes to Arya to successfully complete this challenge. People looking for online information on Arya, Rajinikanth will find this news story useful.